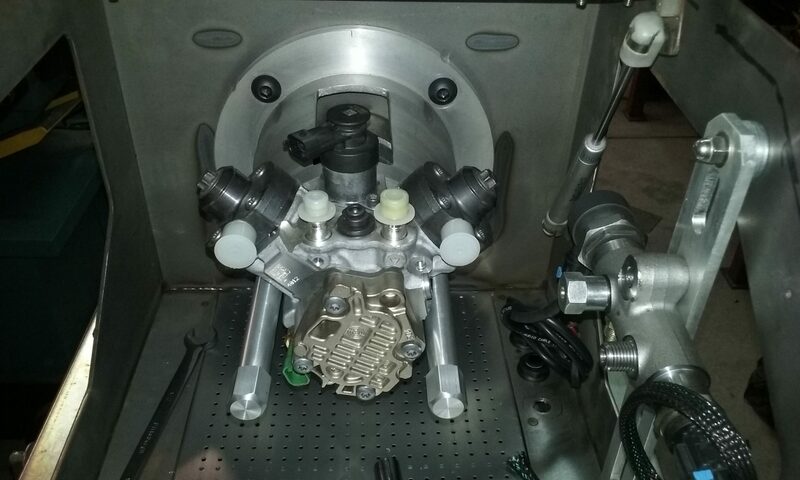 We offer common rail high pressure pump testing services. If you are replacing injectors, it is a good idea to also check the condition of the pump, after all it could possibly be the reason for injector failure. We test the pump for output at various rpm ranges, such as cranking speed, and wide open throttle. We also inspect and calibrate the cascade valve, inspect the supply pump for wear, and check the FCA/Regulator “Mprop”, for flow control regulation and reaction. At the time of testing we can also optimize the output of the CP3 for higher flow output, if all the components and the pump will support the modification. In stock form the CP3 will flow 175-200 LPH, yet it has the potential to flow in excess of 225 LPH. The modifications performed will allow for quicker acceleration and faster throttle response.All this equates to increased efficiency and a potential for added fuel mileage. We have reports of customers gaining up to 2 MPG with this modification, and they have also noted a reduction in smoke and lower EGT’s in some cases. These modifications would be the equivalent of the Arson 3 CP3 upgrade kit we offer, yet it would save you substantially by modifying your existing components. You would also have the test results depicting the increased flow potential. For towing, higher performance programming and supporting up to 45% oversize injectors, this is the recommended modification. Over the years we have literally sold thousands of Arson CP3 kits, a quick Google of that name will show you what others have had to say concerning this modification since 2007.